Let’s get the negative out of the way first – Sylvans Restaurant is a pain to get to. However, it’s worth the effort if you do make it out there. The beers are world class fresh, cheap, and the outside gardens make you want to stay for much longer. While we did go the anniversary on the first day back in July, the second day we returned it was still regarded as one of the best breweries / brewpub to visit in Japan. The whole place is non-smoking, and the outside gardens have plenty of space to relax in. The beers are well-priced and can also be bought to take away as well. It’s definitely family friendly as well as we saw plenty of kids out in the gardens though less inside. Disclosure aside – I’m a little biased towards Fujizakura. They were one of the first craft beer breweries I tried in Japan, and have enjoyed ever since. Sylvans has also been on my list of places to go to; however, its distance from anywhere has meant I’ve lacked the time and energy to get there. The head brewer, Miyashita-san, is also one of the friendliest people I have ever met and can be seen at many a Japanese craft beer festival, with a grey chin-strap beard. Sylvans Restaurant is located about a 15-minute bus ride from Kawaguchiko station, though seeing as it’s uphill most of the way, walking it is not advised as it would take about an hour or so through some long uphill roads. You can also get to Sylvans Restaurant from Mt. Fuji station too, though it takes slightly longer on the bus at about 25 minutes or so. Once you arrive, it’s hard not to take in the sheer size of the building. I have to admit, I thought it was going to be a massive sprawling two storey beer hall – but alas no. 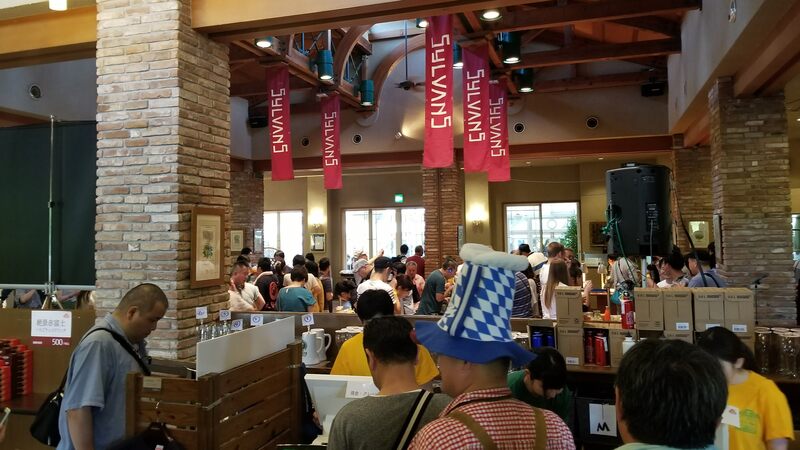 The first floor has some of the brewery space inside, while the second floor does have a sprawling German style beer hall – does Yamaguchi have a thing for German beer halls? There is a huge sprawling garden outside too, with a dog run to one side of it as well for those people with pooches large or small. The whole place is non-smoking, though I didn’t notice any wifi in the area either. There was also no table charge either. There are between four and six taps on at Sylvans, with only Fujizakura regular beers and a couple of seasonal beers on tap too. The beers come in three different sizes: small (250ml) from ¥450, medium (400ml) from ¥700, and also pitchers (1.6L) at ¥2,000. There is also a four-beer tasting flight of 100ml for ¥850 but none of the prices include tax so add on 8% to the bill before leaving. The beers were all freesh tasting and served in generous sized glasses so you got 250ml of beer and not 200ml with 50ml of head and so on. You can also buy bottles to take away; however, there were no growlers or larger sized cans for sale when we went. The food at Sylvans Restaurant was mostly German based, with sausages and meat being the most popular choices. There were also some pasta, rice, and salad choices going as well, so there is something for everyone. The menus are both in English and in Japanese. The closest station to Sylvans Restaurant is Kawaguchiko Station on the Fujikyuko Line. Take the bus bound for the fifth station of Mt. Fuji. Just after purchasing a Panasonic DMC-LX3 camera in April 2009; my next foray to Japan was in May. Through the World-Wide Web, I learned there was a chartered jaunt to other breweries beyond Tokyo (by TimE). I signed up for it. This was one of the breweries which we hit. This was when Scott Brimmer of (now) Brimmer Beer was Fujizakura’s brewmaster. The beers were very good. BeerTengoku would do well to identify when craftbeer-oriented persons organize a bus tour of venues like this which are beyond Tokyo.